As I stated in my last post, on the day of the new Soak Creek section of the Cumberland Trail’s grand opening, many people had come out to walk the new trail. But one woman, Lisa Huff stayed behind. I passed her as she worked. a grass that as I explain in my book Wildly Strolling Along came to Tennessee as a packing material. Less flashy in its dominance than kudzu, it still takes over whole forest floors. But among that bundle was something that belonged in the woods even less: a black, curly wig. At least it wasn’t this guy’s wig. 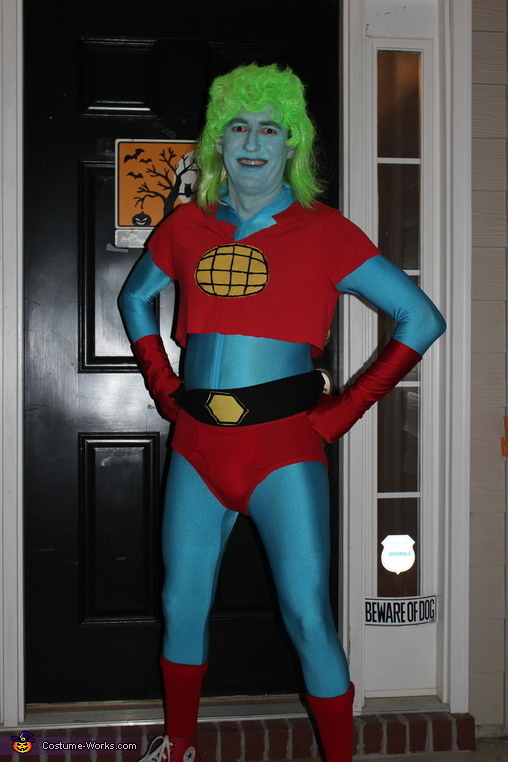 For those of you not my age or just slightly older, the guy above is Captain Planet, a guy who taught children such as myself not to litter and about other environmental problems through what now seem to me to be enjoyably dumb children’s superhero antics, sometimes even getting the science wrong. He never told us not to throw wigs in the woods though because such a concept never occurred to most people. “People leave monuments that they intend for future generations to notice, like cemeteries, churches or pyramids. Then there are relics like these, thrown in order to be out of everyone’s way but telling a more honest story for the noticers that spot them. Yes, I invented the word noticersTM. No, I’m not going to change that in any later editions. It’s the name of a whole chapter. My book. I make the rules. I won’t go any further. Anti-litter PSAs are a dime a dozen and sadly they haven’t helped. Anyway, I salute all those who work on the trails we enjoy to keep them clean. May they continue. Tucked away on a road closed to through traffic, the route to Stinging Fork Falls is probably quiet most of the time. Not this time, however. Today, thanks to a ribbon cutting and the anniversary of the Wild and Scenic Rivers Act, the parking lot was full and I saw many people coming back as I hiked forward. I recommend the hike to the falls as a fairly short walk with excellent payoff after rain. Granted recent rain also made the trail’s rocks slippery, and the descent is somewhat steep. The trail continues along Soak Creek in the other direction eventually rising back up. As it’s a new part of the Cumberland Trail, it’s marked by ribbons not blazes but the trail already has stone steps laid down by volunteers. The recent rain meant occasionally crossing cascades and at one point, I even saw a salamander run from underneath a rock. I did not reach the end of this new Cumberland Trail section. It was built too recently to include in my book Wildly Strolling Along, which I promoted shamelessly to everyone who walked by. Still, I plan to return. The entrance is on Shut in Gap Road near Spring City. This page from the Cumberland Trail Conference is outdated, but it shows the trail head and the route to the falls. The new trail heads to the right along Soak Creek while the falls route as shown here is to the left. As summer is refusing to surrender to autumn here in East Tennessee, the Cumberlands are exploding with flowers. My Dad Larry Pounds and the co-author “Wildly Strolling Along” along with me recently led a group of wildflower lovers to two unique habitats near each other. Both were part of Catoosa Wildlife Management area. First was a meadow area with a short access road on which we walked. We would stop every few minutes and Dad would get down, examine, give Latin names, sometimes certain, sometimes speculating, surrounded by others who seem drawn like bees to them. Next we drove down to a “cobblebar,” along Daddy’s Creek, a which is not a place for booze and homemade desserts but rather a rocky area along the banks of a stream. It too had flowers, some growing out of big outcrops. A pool not too far from the trail entrance is also good for swimming. I was the only one of our party who jumped in, possibly because everyone else was identifying more ferns and flowers. Which far too often, I can’t do. But I am me. My Dad is himself. Not everyone can name every flower. But maybe you can at least enjoy them.